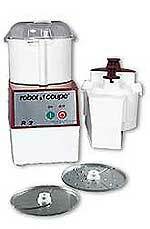 Combination Vegetable Prep and Vertical Cutter-Mixer. Prepare 850 servings in 3 hours or less. Vegetable prep attachment specially designed for quality, continuous feed slicing, shredding, grating and julienne. Accommodates 21 different processing plates. 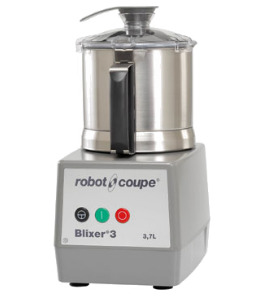 Bowl attachment designed as vertical cutter-mixer: chop, puree, blend, mix and knead dough. Direct-drive, fan-cooled 1/2 HP motor. Special On-Off push-type switch. Attachments easily removed for cleaning. Two deep feed openings. Stainless steel cutting plates. Continuous feed vegetable prep. 2 1/2-quart stock-pot shaped cutter bowl. See-through lid. Packed with two cutting blades as standard. Attractive, compact design. 1-year parts and labor warranty. Standard Model: Includes motor base unit with On-Off switch, 2 1/2-quart cutter bowl with stainless steel S blade, continuous feed unit with discharge plate, one medium 5/64" grating plate and one 5/32" inch slicing plate. 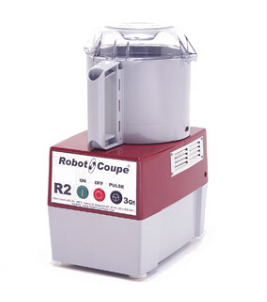 Electrical Requirements: 120V, 60Hz, 7.0 amps, single phase. Motor: 1/2 HP, capacitor-type, fan-cooled, 1725 RPM. Switching: On-Off push-type switch will not operate without bowl lid or feed locked in place. Bowl Capacity: 2 1/2 quarts.